The MMA scene is probably one of the loudest sports industries in the world. Not only because people scream during the fights, but also because of all the noise when it comes to fighter marketing. It clearly shows that the more controversial you are the more attention you get here. And more attention means more eyeballs, and more eyeballs mean more dollars. But let’s step away from the fighters hailing from Ireland or the Caucasus region (you know who I’m talking about). And head north, to see what the descendants of Vikings are like when it comes to fighting without rules. They sure didn’t have any a millennia ago did they? 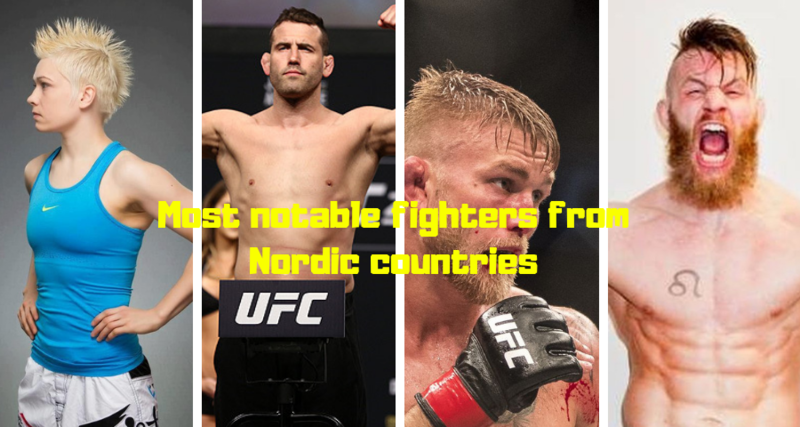 The website Norsk Casino Online has come up with the list of most notable MMA fighters coming from Nordic countries. And we are happy to reproduce this list for you in English. Kankaanpää is probably one of the most popular female fighters in the world. Let alone the most popular Finnish fighters. Kankaanpää is believed to be one of the most successful fighters hailing from the Nordic countries, thanks to her purple belt in the BJJ tournament and many many more victories over the years. However, she has been retired since 2015 and is not looking into coming back into the game. She was awarded the Nordic female fighter of the year award for 2014, which is also considered as one of her greatest accomplishments. Her victories got her a lot of fans throughout the world, as well as a nice nickname of “Killer Bunny”. Alexander Lars-Åke Gustafsson was born on January 15th, 1987. He is a Swedish MMA fighter, currently fighting in the light heavyweight division. Because of his massive success in the sport, he was ranked as #2 in all of UFC light heavyweight rankings. I think his nickname is quite predictable but I’ll tell you anyway. He can be referred to as The Viking, or The Mauler. The Viking Gustaffson has been fighting ever since he was 10 years old. After 22 years of doing this, you would expect hit to be really good at it right? Well, you’d be right, as I already mentioned his rank. Gustaffson is considered to be second only to the most popular of UFC fighters. Meek is currently fighting in the UFC’s Welterweight division. He is considered to be one of the most successful fighters to ever hail from Norway. His Viking roots alongside Gustaffson has earned him quite a fitting nickname, Emil Weber “Valhalla” Meek. After making his debut in 2012, he has been on the rise ever since. His most notable achievement was on August 20th, 2016, when he won the Venator Fighting Championship Welterweight title by defeating Rousimar Palhares by knocking him out in the first round. And now onwards to Denmark. Joachim Christensen is considered to be one of the most successful fighters from the small country. He competed in the light heavyweight division of the Ultimate Fighting Championship (UFC) and is well renowned for it. As of right now, Christensen does not hold andy serious titles but is still considered as a force to be reckoned with from his opponents.